What's new in HDR Imaging? Cool stuff from the world of tomorrow. Out Now! Click here to order my new book from Amazon! 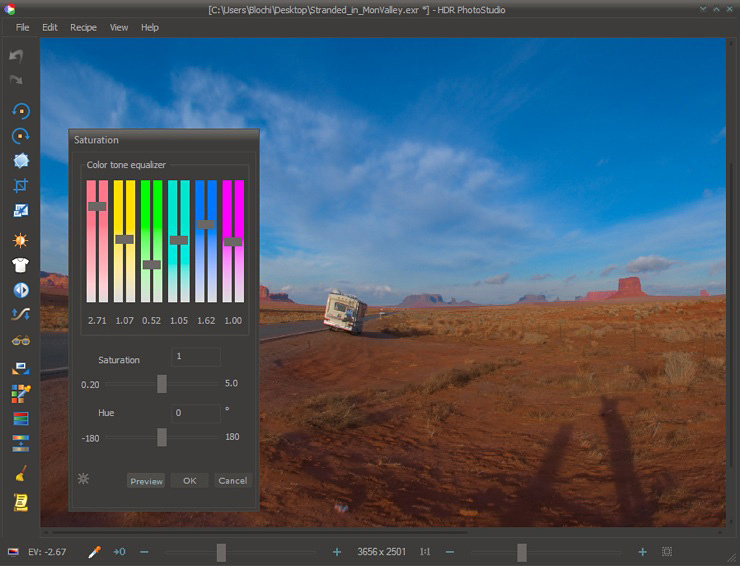 Take the HDRI Handbook 2.0 with you wherever you go. The eBooks do not include the companion DVD! They are great as second copy for reading on-the-go, but they are no substitute for the real physical book . HDRLabs is not a company. It's a loose gathering of HDR nuts from many different fields. What connects us is a dedication to push various HDR-related projects forward. We've seen a bunch of new HDR programs lately, most of them very similar in the general approach: You merge an HDR, you tonemap, you do your fine adjustments in 8 or 16 bit, and then you save your final image. 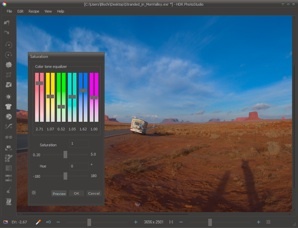 Unified Color's HDR PhotoStudio breaks this workflow paradigm, and I love them for that! So, what does HDR PhotoStudio do differently? Slick dark production interface of HDR Photostudio. Very simple: The image is kept in 32-bit floating point at all times. Instead of one Monster-Tonemapping window, you get a full shelf of tools to tweak an image until your eyes are bleeding. You'd use the Shadow/Highlight tool to recover blown out areas, then use the Local Contrast tool to give it some punch, correct the White Balance, or selectively finetune some colors. One tool after the other. Each time you're working on the full image, you see exactly what you get, and you're still in 32 bit. Tonemapping can be that simple! Waaaaait a minute ... isn't my monitor just 8 bit? How can this possibly be WYSIWYG when the image is kept in 32 bit? Exactly. That is the fresh approach of this program! What you see on your 8 bit monitor is what you will get when you save it in an 8-bit format like JPG. There's absolutely no need to break the image down to 8 bit anytime before it's saved. See, your monitor doesn't have 4000 by 3000 pixels either, yet you can still edit your 12 Megapixel image. That's what the Zoom slider is for. The same way you can edit an image with high dynamic range on a low dynamic range device. That's what the Viewing Exposure slider is for (called Display Brightness here). Same thing, really. In a way, this approach is actually more conservative than revolutionary, it's just as you would expect from a regular image editor. You load your image, you apply your tools, one after another. Until your like it. Back to old school, I'd say! Here is a little quality evaluation on the infamous KitchenWindow.exr from my book DVD. If you tried tonemapping this yourself before, you will have noticed that this image has such a high contrast that it quickly turns into halo-hell. Except for the bad quality of my animated GIF, this clearly confirms that HDR PhotoStudio isn't only very effective in suppressing halos, it's also very good in preserving a natural look. 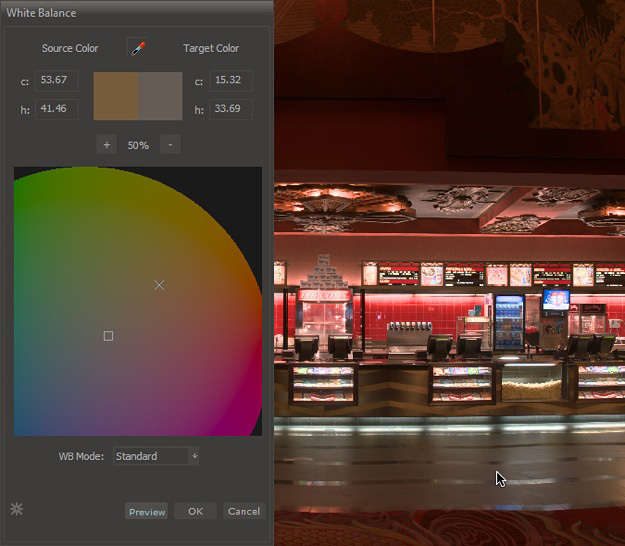 White Balance with a color wheel, wrapped in an intuitive professional interface. What's really great about this new/old approach, is that you don't have to save in 8-bit. Whatever you did, you can still save your image in 32-bit. That opens a whole new world of usefulness, way beyond tonemapping as we knew it. Now, this is the part where I was about to insert my standard rant about missing EXR support. But, thankfully, the programmer was listening and in the next version (coming soon) you can in fact save OpenEXR images. Currently available options are TIFF32 (wastefully big), and their own proprietary / highly compressed BEF format. The program comes with a BEF plugin for Photoshop, which is a nice touch, but ultimately only a standard format fits in everyone's pipeline. You've rarely ever seen me wave the fanboy flag like this. But if you're serious about HDR editing, you need HDR PhotoStudio. Period. Sure, it needs plenty of resources, but that's reasonable for full 32-bit editing. Currently, it doesn't work well with large images (>25 Megapixels), but as soon as I complained about this, head programmer Igor threw together a 64-bit version that solves that issue. So, extra points for listening to the user base. There's no Mac version (yet), so that's bad. But that's about it. 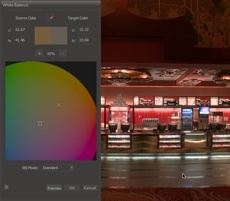 As you've come to expect, the HDRI Handbook is your VIP ticket for getting a 30% discount. For you, my friend, that's $99.99 instead of $149.99. What a deal! The sibl-of-the-month is a scenic dirt road in Monument Valley (panoview here), especially for all you 3D car fans out there. We're currently in the process of updating the Smart IBL project to the next level, so if you're feeling adventurous today join the beta force in the forum. You've been warned!